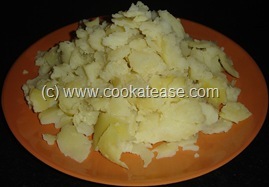 Potato is available throughout the year and children like it more. 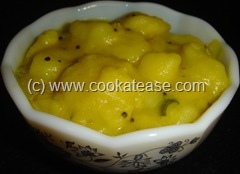 Potato is used in combination with any vegetable, in Raitha and also as solo (Boiled Potato Fry, Potato Round Fry). 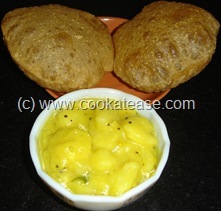 Here I have prepared Poori Kizhangu in authentic way that is exclusively served with Poori. 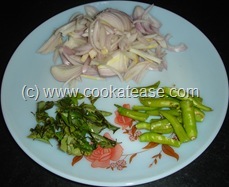 Boil and mash potatoes partially; cut onion into thin slices in lengthwise; slit green chilli and chop curry leaves. 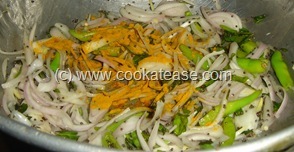 Heat a pan with oil and do the seasoning; add onion, green chilli and turmeric powder; stir for few seconds, do not brown the onion. 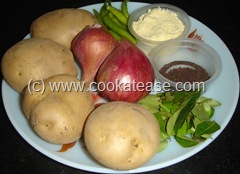 Add 2 cups of water bring to boil; keep in low flame and cook for 6 to 8 minutes till onion is soft and mashable with finger; add potatoes and salt, cook for few seconds; mix Bengal gram flour in half-cup water without lumps, add in the potato; cook for few more seconds or till the Bengal gram flour is cooked; now you will find poori kizhangu thick. 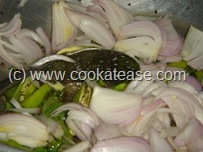 The onion should be fried for few seconds only and thereafter it should be cooked more after adding water. poori kizhangu came out really good. 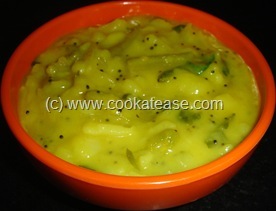 Thanks for a good receipe!! !